PlayStation Now users will not necessarily need a PS3 or PS4 to access the service. We tested it on a new Sony Bravia TV. As we mentioned earlier today, Sony CEO Kaz Hirai kicked off CES by announcing PlayStation Now, a cloud-based service that will allow PlayStation 4 users — and users of other select devices — to play PS3 and PS2 games that currently don’t run on the PS4. This afternoon, we were able to get our hands on the service and find out some more details about how it works. At the Sony booth, we got to play a bit of PS3 exclusive game The Last of Us. We weren’t playing on a PS4, but on a new Sony Bravia TV that includes the PS Now app. The company rep swore up and down that the TV was not directly connected to a PS3 or a server in the convention center, but via the Internet to one of the many U.S.-based data centers the company has set up for the service. Sony maintains that these strategically placed data centers will be sufficient to handle the inevitable data drain as millions of users attempt to play online. In terms of performance, we noticed the occasional stuttering, but nothing that you don’t sometimes find in disc-based console games and no dreaded hang-ups from a bogged-down connection. There was a slight drop in picture quality compared to the console version of the game, but it’s hard to say if that’s something a casual gamer will notice. Of course, these impressions are based on effectively zero traffic to the data centers, with just a few users accessing a handful of games from one location. There is no way to predict how PS Now will perform once the floodgates are opened. We played the game with a PS3 DualShock controller hooked up to the TV via USB. Sony says that both the PS3 version and the PS4 version will work with PS Now games. It hopes to add support for smartphone and tablet controllers in the future. Users will have two options for buying games — either a subscription (no price given yet) or a la carte game purchases. Pulling out the old “Netflix for games” comparison, a company rep called that a “fair analogy.” He then suggested his own analogy of going to restaurant and ordering a la carte or from the buffet. The idea, explained the rep, is for PS Now to be a platform for exploration and discovery of new games you may not have known about or played before. 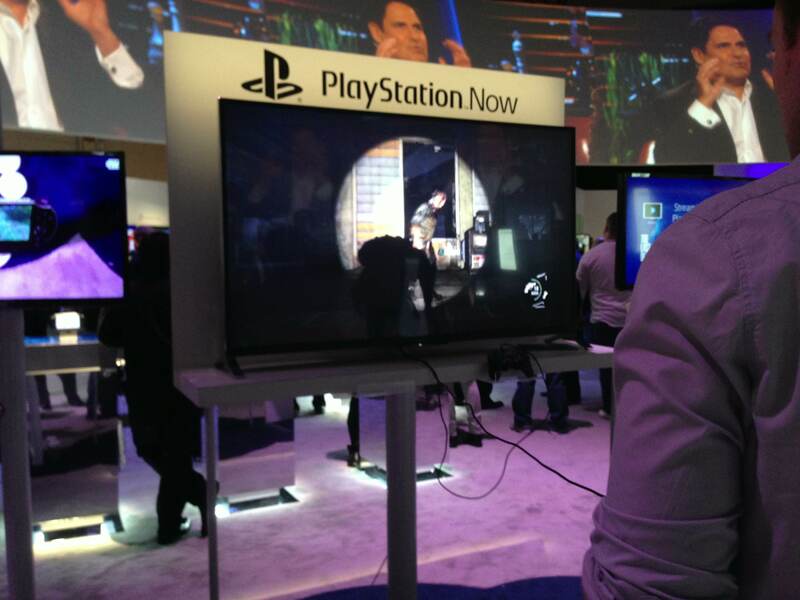 We believe that all the games available for the CES demo of PS Now were Sony exclusives. When pressed about which game publishers might be lined up for launch titles, the rep remained mum but did seem to hint that this is still all in the early stages. Sony says that games on PS Now will be fully featured, just like the games you buy on disc or download from the PlayStation store. Alas, without knowing what other publishers are involved or what restrictions they will demand on their titles, we believe it’s too early to make this assumption. The big question is whether PS Now will allow people who already own PS2 and PS3 games to play those titles online without having to re-purchase the game or pay a fee. Both Sony and Microsoft currently charge a fee for owners of certain previous generation games to upgrade to the new-gen versions of those titles. Sony tells Consumerist is has not yet made a decision regarding that option, but that it hasn’t necessarily shut the door to the possibility. The company rep says these decisions will likely be made based on user feedback during the upcoming closed beta. No specific launch date has been given, but Sony says that the closed beta is set to kick off soon, and that it will first be announced on the official PlayStation blog. Alas, the company has not yet finalized what the criteria might be for users to be eligible for the test. One other unresolved issue is whether PS Now games will be available to users the same day as their console versions are released, or if — keeping with the whole “Netflix for games” idea — there will be a delay between the console version going on sale and a title going up on PS Now. If we had to take a guess, we would not be surprised if pressure from retailers — who still make quite a bit of money from disc sales and push a lot of Sony TVs, stereos and other electronics — pressure Sony to put some brief delay in the release schedule. We could also see a la carte streaming purchases made available on the launch date for a game, while there is a delay in making that same title available to subscription customers. It’s all a big wait and see at this point, but it’s nice to know that someday I may be able to play my PS2 and PS3 favorites without having to have those old consoles sitting on the shelf.